These small reef fish are usually found as a bright orange color with three white bands outlined in very fine black lines, but regionally some are a darker red-orange or even black with white bands. Each fish forms a relationship with a specific sea anemone, acclimating its protective mucous to the anemone’s stinging tentacles. They are protandrous hermaphrodites and live in small groups, so the largest fish is female, the second largest fish is the breeding male, and the smaller fish are non-breeding males. If the female dies, the largest male becomes the female, and the next largest male becomes the breeding male. The clown anemonefish is often confused with the orange clownfish. The clown anemonefish is referred to as an anemonefish due to its symbiotic relationship with sea anemones. Other English language common names include common clownfish, false-clown anemonefish, nemo, and western clownfish. Other common names are almindelig klovnfisk (Danish); kakure-kumanomi (Japanese); bombin, gombing, inggu (Malay); and obyknovennaya rybka-kloun (Russian). This fish is not harvested for human consumption, however they are often displayed in salt water aquariums due to their high survival rate in captivity. The clown anemonefish is also successfully raised in aquaculture facilities which decreases the pressure on wild populations to supply the saltwater aquarium trade. 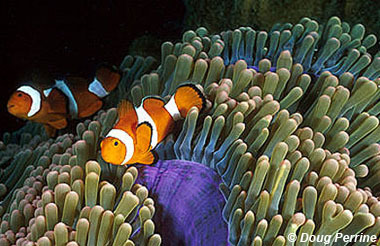 In some areas, local populations of the clown anemonefish have been impacted by over-collecting for the aquarium trade. Other future threats may be habitat degradation through environmental impacts on coral reefs. However, at this time, the clown anemonefish is not listed on the World Conservation Union (IUCN) Redlist as an endangered or threatened species. The IUCN is a global union of states, governmental agencies, and non-governmental organizations in a partnership that assesses the conservation status of species. The clown anemonefish lives in the warmer waters of the Indian and Pacific Oceans. These fish are found in the Indo-Malaysian region from the Ryukyu Islands, Japan throughout southeast Asia to northwest Australia. The clown anemonefish is a non-migratory species that lives in tropical, marine habitats associated with rocky or coral reefs. They are found at a depth range of 10 to 50 feet (3 to 15 m). 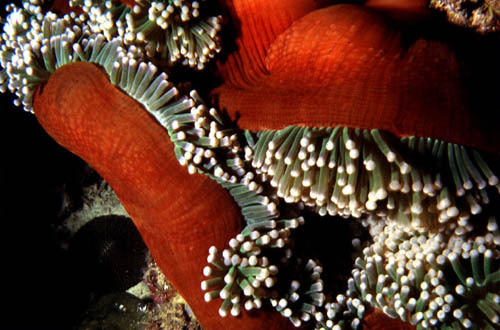 They form symbiotic associations with the anemones Heteractis magnifica (most commonly), Stichodactyla gigantea, and Stichodactyla mertensii. Anemones provide protection for these fish as well as their nests. In return the anemone may benefit from fish consumption of parasites and increased water circulation from the fanning action of the fish’s fins. Anemonefishes have mucous covering which protects them from the sting of anemone tentacles. Acclimation must occur before a fish is immune to the stinging tentacles. This is achieved by the fish swimming around the anemone and rubbing its ventral side and fins on the tentacles. 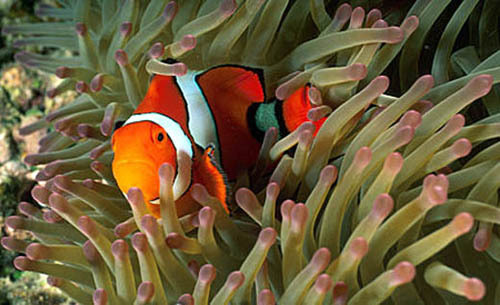 The clown anemonefish has one lateral line with interruptions and 34 to 48 scales along the lateral line. The dorsal fins contain a total of 10-11 spines and the pectoral fins have 17 rays which help to distinguish it from other species of anemonefish. The caudal fin is rounded. The clown anemonefish resembles the orange clownfish (Amphiprion percula), however there are some characters which help to distinguish it. One of the best ways to distinguish these two species is examination of the black band that separates the orange color from the white bands present on the fishes body. The clown anemonefish has thin black bands, sometimes so thin that they may appear to have no black bands at all, while the orange clownfish has thick black bands separating the orange and white coloration of the body. Additionally, the clown anemonefish often has a slightly less brilliant color than the orange clownfish. Also, viewed from a head-on perspective, the clown anemonefish’s head appears plain while the orange clownfish’s head has a pronounced bulging face similar to a frog. These two species also differ in the color of the iris. The clown anemonefish possesses a grayish orange iris which gives the appearance of the eyes being larger than they actually are; the orange clownfish has a bright orange iris which has the effect of making the eyes look smaller. The body of the clown anemonefish is orange with three white bands at the head, middle, and tail regions. The middle band bulges forward toward the head centrally. There are thin black lines around the white bands that appear to be missing unless closely examined. The tips of the fishes fins are rounded with black bands. The maximum reported total length of the clown anemonefish is 4.3 inches (11.0 cm). These fish are believed to live approximately 6 to 10 years in the wild. 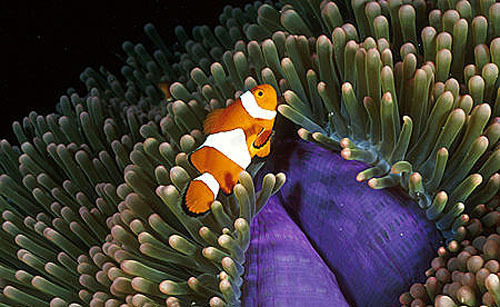 The diet of the clown anemonefish consists of a variety of prey items. This anemonefish forages on algae, copepods, isopods, and zooplankton as well as obtains food from the host anemone. The anemonefish will eat the dead tentacles of the anemone and any uneaten prey that is captured by the stinging tentacles of the anemone. The mating behavior of the clown fish has not been extensively studied but the general behaviors of anemonefish have been reported. The clown anemonefish lives in a social group that has a strict dominance hierarchy. The larger fish is always the female while the second largest is the male. They are the only two individuals that reproduce within the group through external fertilization. The non-breeding individuals progressively decrease in size further down the hierarchy. Anemonefishes are characterized by being protandrous hermaphrodites which means that all fish develop into males first and then potentially into females later. More than one anemonefish may reside in the same anemone, however if the female were to be removed from the group or die, the largest male would then become female. Females control males through aggressive dominance, thereby controlling the formation of other females. This anemonefish is territorial with its host anemone and mating pairs are monogamous. Before spawning occurs, the male will build a nest on a bare rock substrate close enough to the anemone to provide some protection from predators. Males attract females through courting behavior characterized by extended fins, biting, and chasing. During spawning, the males become increasingly aggressive. When spawning begins, the male will chase the female to the nest at which time the female will make several passes over the nest until she releases her eggs. She lays eggs that are orange in color, measuring 3-4 mm in length and numbering from 100-1,000 depending upon the age of the fish. The male then passes over the eggs and fertilizes them. The fertilized eggs remain attached to the bare rock substrate by fine adhesive threads. The male looks after the eggs, fanning them with his fins and eating any eggs that are infertile or damaged by fungus. However, once the eggs hatch, the male’s parental care ends. Water temperature affects incubation time with cooler temperatures resulting in longer periods of time. Incubation time averages 6-8 days, followed by a planktonic larval stage that lasts for 8-12 days after which the juvenile fish settles to the bottom substrate in search of a host anemone. 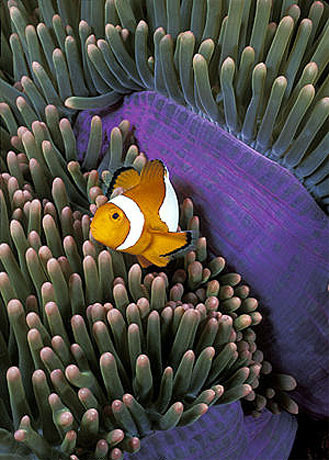 The number of predators the clown anemonefish has is greatly reduced because of its symbiotic relationship with the anemone. 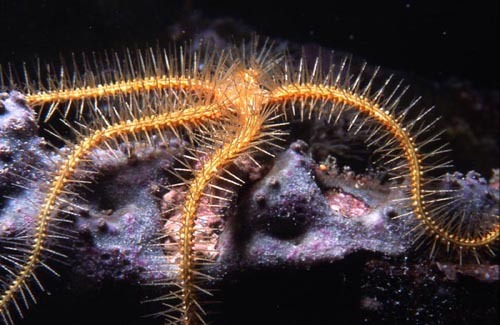 The eggs are susceptible to attack from other damselfishes (Pomacentridae), wrasses (Labridae), and brittle stars (Ophiotrichidae). The clown anemonefish was first described by Cuvier (1830) as Amphiprion ocellaris. The genus name Amphiprion is derived from the Greek word “amphi” which means on both sides and the Greek word “prion” which means saw. Other synonyms used in previous scientific literature include Amphiprion melanurus Cuvier 1830 and Amphiprion bicolor Castelnau 1873.